Food Safety Assist was started by Brian Humphreys in 2000. 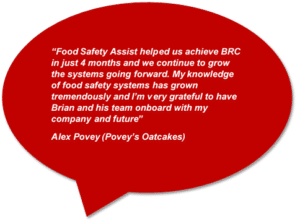 Our aim is to offer food businesses tailored, practical solutions in all areas of food safety, food hygiene and health and safety. He has worked within major supermarkets, food suppliers and producers. Brian is a SALSA auditor, mentor and co- writer of the new SALSA standard version 5. He is also highly experienced in BRC Food Safety and BRC Storage and Distribution standards. We also have 2 highly qualified and experienced associate consultants Hannah and Aditi. Find out more about them on our meet the team page. Our flexible approach means it is possible to provide onsite or office-based support, assisting from the shop floor right through to the mentoring of directors. We offer a range of contracts depending on the needs and circumstances of each individual client; from pay-as-you-go to tailored project-based packages.